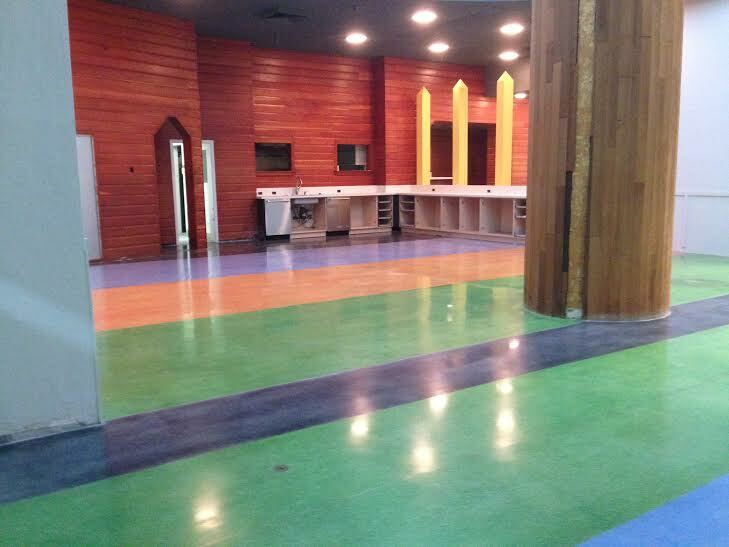 Once you decide you want a new stained concrete floor in your space, Concrete Staining Contractors Raleigh can help. you have a huge number of decorative options available to further enhance the attractiveness of your floor. The last thing you want is an ordinary floor, and that’s why we go the extra mile to make your stained concrete floor look exceptional! Decorative engraving. We offer you a host of decorative engraving options for your floor, including stenciled graphic designs, to make it even more unique. By applying any combination of stains, dyes, or decorative cutting to your polished concrete floor, we can give it the spectacular, glistening look of polished stone without the enormous expense. Your decorated, stained concrete floor can withstand high traffic over an extended period of years and will outlast many other more expensive flooring options, including carpet, tile, and vinyl. The AIA (American Institute of Architects) and the US Building Green Council have officially recognized concrete as a sustainable design material. Stained concrete floors are highly resistant to both scratching and stains, and they require no polishing or sealing once they are complete. The only action required to maintain a polished concrete floor is periodic mopping with warm, soapy water. A polished concrete floor will never chip or peel, and will meet the OSHA requirements for being safe and slip resistant. Call BCS Stone Surface Innovations today for a consultation and find out why polished concrete is the floor of the future!